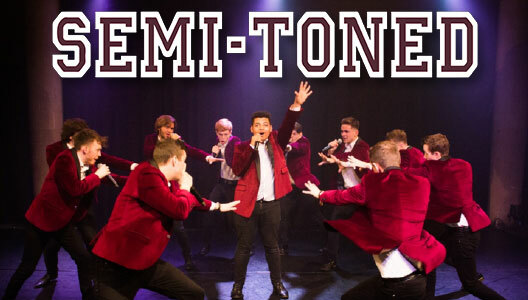 Semi-Toned was formed in 2010 at the University of Exeter as a five-man barbershop harmony group. Now, in 2018, the group is twelve men strong and at the forefront of a cappella in the United Kingdom. In April 2015, the group earned the title of national a cappella champions, after winning the Voice Festival UK, but they have become best known for their recent TV appearances. The first of these was on BBC2’s 2016 show ‘The Choir: Gareth’s Best in Britain’, which the group went on to win in front of an audience of over 2 million viewers. In 2017, they appeared again as finalists on Sky 1’s ‘Sing: Ultimate A Cappella’. The group also produces their own music videos, the first of which, Rich Man, has amassed nearly 130,000 views on YouTube, whilst their most recent video, covering Beyoncé’s 7/11, was the most nominated video at this year’s A Capella Video Awards (AVAs). The video went on to win two awards for Best Electronic/Experimental Video and Best All Male Collegiate Video from its six nominated categories. Semi-Toned also performs annually at the Edinburgh Fringe, and is the only a cappella group ever to have received the prestigious Bobby Award from Broadway Baby. The group is excited to now return to the United States to embark upon their third tour, performing their new show ‘Season Three’ along the East Coast from Florida to New York.